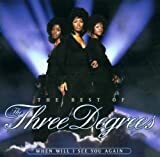 The Three Degrees is an American female vocal group, which was originally formed in 1963 in Philadelphia, Pennsylvania. Although a total of 15 women have been a member over the years, the group has always been a trio. The current line-up consists of Valerie Holiday, Helen Scott and Freddie Pool. Holiday has been a member since she first joined in 1967, while Scott has been a permanent member since 1976, having previously been in the group from 1963 to 1966. The group were particularly successful in the UK, achieving 13 Top 50 hit singles between 1974 and 1985. The original members were Fayette Pinkney, Shirley Porter and Linda Turner. Porter and Turner were soon replaced by Janet Harmon and Helen Scott. The line-up from 1967 to 1976 was Pinkney, Valerie Holiday and Sheila Ferguson, who would go on to sing lead on most of the group's biggest hits. This line-up topped the US Hot 100 as featured vocalists on the MFSB single "TSOP (The Sound of Philadelphia)" in 1974, and had seven UK Top 40 hits, including the 1974 single "When Will I See You Again", which was a huge international hit, peaking at number two in the US and topping the UK Singles Chart. When Pinkney left the group in 1976, she was replaced by a returning Helen Scott. This line-up had four UK Top 20 hits, including "Woman in Love", which reached number three in 1979. Ferguson left for a solo career in 1986. The group's most stable line-up was from 1989 to 2010, with Cynthia Garrison joining Holiday and Scott. They achieved a final UK chart entry, reaching number 54 in 1998 with a dance cover of "Last Christmas". Garrison left the band at the end of 2010 due to health reasons, and was replaced by Freddie Pool in 2011. The group's 2016 album, Strategy: Our Tribute to Philadelphia, was their first studio album release with Pool as a member. Holiday and Scott have now been members of the group together for over 40 years, with Holiday having been a permanent member for over 50 years.